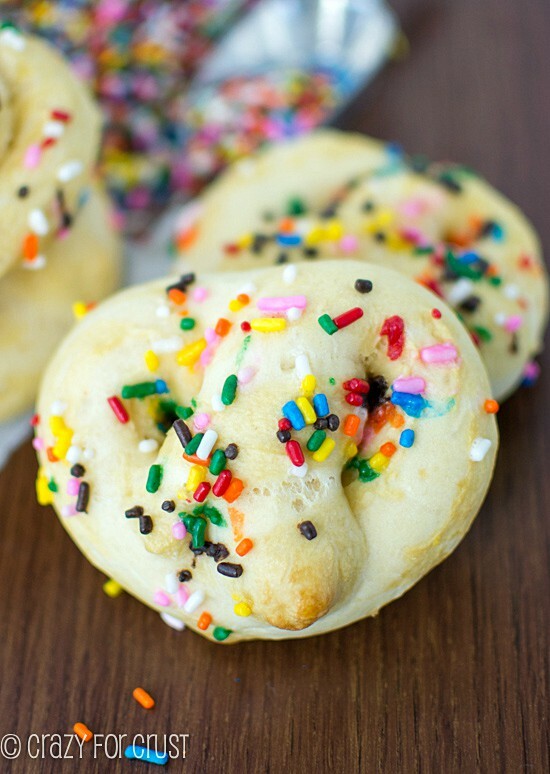 These Cake Mix Soft Pretzels start with a cake mix – so they taste like funfetti! I have a housekeeper that comes once every 4 weeks. It’s one indulgence I allow myself, and I pay it from my earnings. I kind of consider it a business expense (hello, sprinkles all over the floor!) and wish the IRS would see it the same way. In other words, I hate cleaning. And given the choice clean or blog, I’ll choose blog. Or, really, anything else that doesn’t involve cleaning. And then I realize I may not have done much cleaning since the last time she was here. Because, in my head, it’s only been a week…or two. So, the housekeeper is here today. I’m so glad I vacuumed the house yesterday. 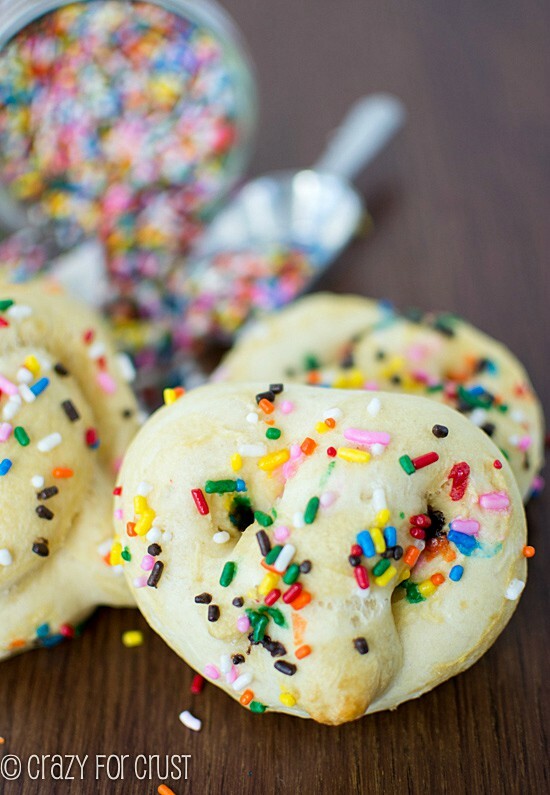 But really, I had no choice – there were sprinkles all over the floor from making these Cake Mix Soft Pretzels. So, last weekend at the Duncan Hines Test Kitchen, Chef Joe (the guy that is the magic behind the scenes) was talking about food trends. One of them was the soft pretzel. I don’t know about you, but I’ve seen them all over the place lately. Sally is the queen of soft pretzels, and Ashton just posted these Pumpkin Pretzel Bites the other day. 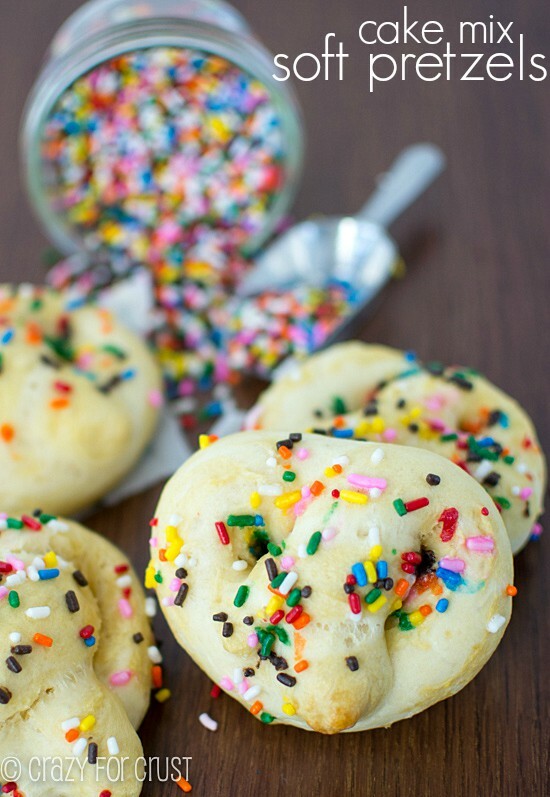 Chef Joe did some amazing things with cake mix and it got me to thinking: could I make a cake mix pretzel? And guess what? You can! Have you ever seen cake mix cinnamon rolls? My friend Christi makes them all the time. A yeasted dough is a yeasted dough, so I thought I’d adapt the method a little and make a soft pretzel. It doesn’t use a whole cake mix. You can double it and use the whole box, but you’ll get 24 pretzels. That’s a lot. Use the partial mix and save it for later. I’ve got more recipes coming. 🙂 Find my funfetti recipes here. I like to boil my pretzels. Baked is fine, but boiling just gives them that little extra pretzel texture and chewiness. It’s not hard to do, it only takes a few minutes, and the end product is totally worth it. But you can skip that part, if you must. Forming pretzels takes practice. This dough is a little thicker than dough I’ve made traditional soft pretzels so they turned out a little puffier. But that’s okay, they’re still amazing. I’ve made pretzels before, so I’m getting better at the twisting, but if this is your first time know it’s normal to end up with oddly shaped ones before you get the technique down. The flavor is not a traditional salted pretzel flavor. It’s cake mix – so it tastes like cake. These taste like cake and pretzels got married. 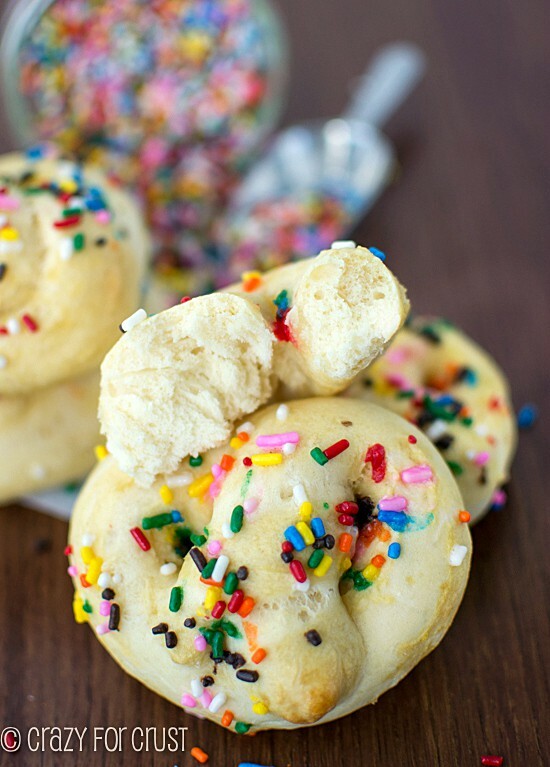 They have the texture and chewiness of a sweet soft pretzel, with the sweetness and hint of cake flavor. 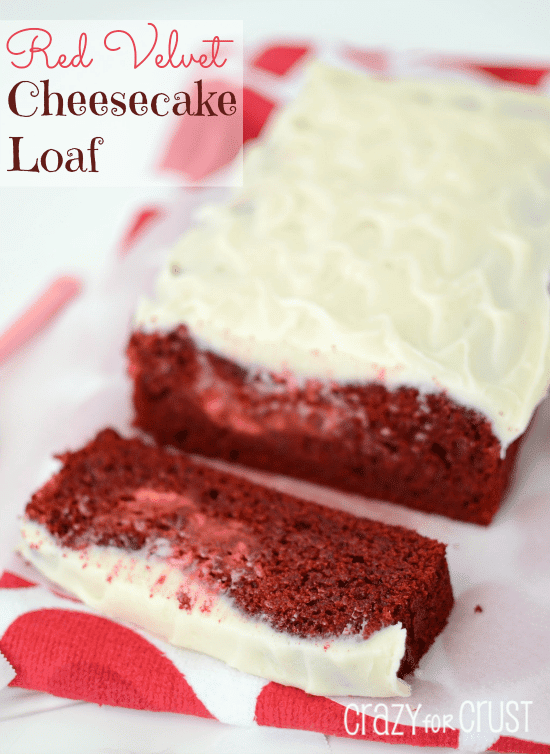 I love the combination – and I cannot wait to make them in more flavors. Add yeast to warm water and stir gently. Let sit for a few minutes. Meanwhile, add cake mix and salt to the bowl of a stand mixer with the dough hook attached. Stir to combine. Slowly pour the water into the mixer while it’s running on “Stir.” Turn it to “2” and add the flour, then let it run until most of the flour is mixed in, then turn it to “4” until the dough comes together. It will pull easily away from the sides of the bowl. Note: you can do this without a stand mixer, but I haven’t. Stir the ingredients together in a large bowl until you can’t stir anymore, then use your hands to knead the dough until it comes together. Place the dough in a bowl sprayed with cooking spray. Cover tightly with plastic wrap and let sit for 1 hour. Turn out dough onto a lightly floured surface and knead just a few times to form a ball. Cut into 12 equal pieces. Place a pot of water on the stove to boil (about 10 cups). Form your pretzels by rolling each piece of dough into a long rope, about 15” long. Bring the two ends up, cross them and wrap them, and bring the ends down to the bottom, forming the pretzel shape. When water boils, add 1 tablespoon baking soda to the water. Working in batches (2-4 to a batch, depending on your pan size) carefully place the pretzels in the boiling water. They will sink to the bottom. When they float, just a few seconds, pull them out using a slotted spoon. Drain well and set them on a cookie sheet covered with a silpat baking mat or well greased. Once all pretzels are boiled, whisk your egg in a small bowl. Use your fingers to spread a small amount of egg on each pretzel. 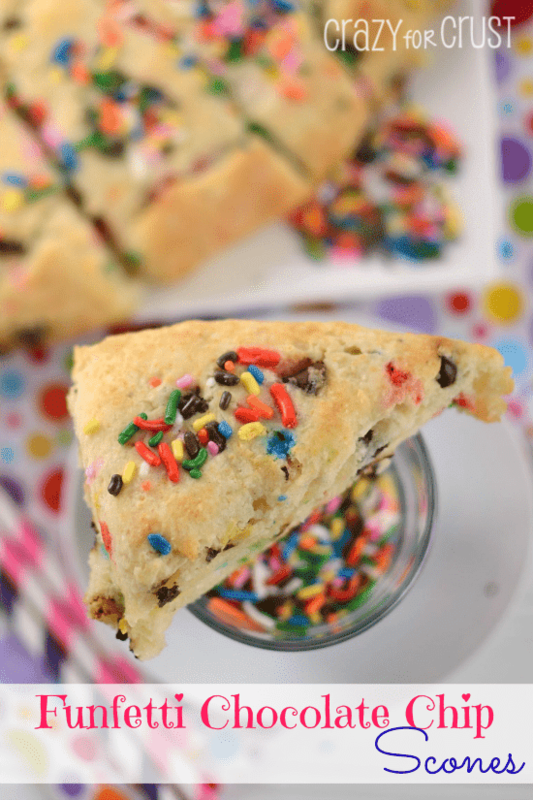 Sprinkle each with about 1 teaspoon of sprinkles. The egg acts as the glue. Bake for 11-15 minutes, until golden brown. Cool slightly before removing from cookie sheets. Do you think these will work with a brownie mix ? I’ve never tried it (it’s on my list). I say give it a try! Make sure you don’t use the whole box of mix; that’s a double batch. And I’m not sure how much flour to use, so start with about 1 cup and work up from there until your dough comes together and isn’t too sticky! Let me know if it works! 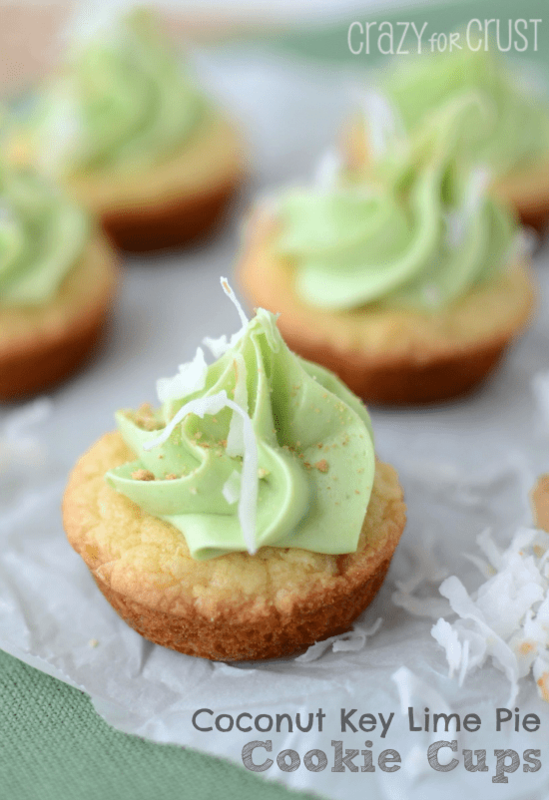 Pingback: Birthday Cake Treats Round up! Your directions don’t make any sense. When do you put in the flour?When you say add water do you mean the yeast water? Yes, the water with the yeast. And you slowly add the flour as the mixer is running in step 1. Pingback: Caramel Glazed Spice Cake - Chocolate Chocolate and More! So would you put this in the dessert category or a sweet roll category? If it’s dessert, does it need a hardening glaze over the top to make it a little sweeter?